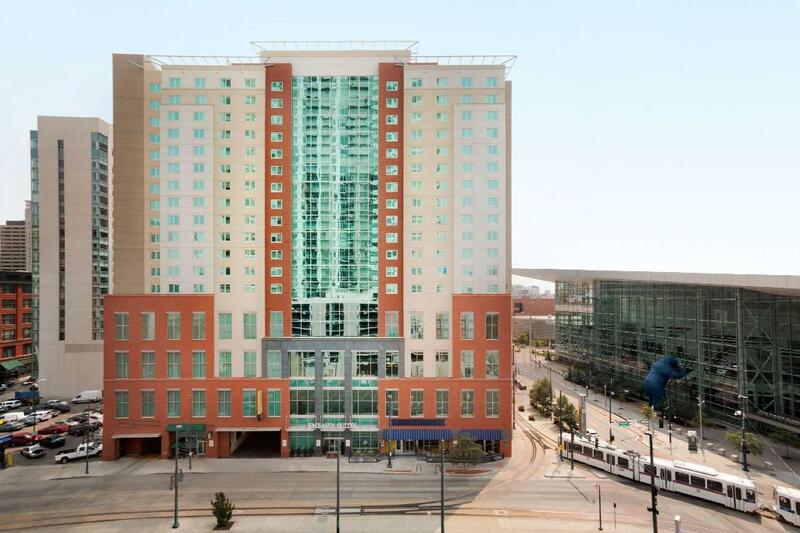 The Embassy Suites by Hilton Denver Downtown Convention Center hotel offers the perfect setting for business or pleasure - a gateway to Denver's lively downtown scene. Boasting a contemporary convention venue, the LEED™-certified hotel is within walking distance of the best attractions in the downtown area and a short drive to best skiing & hiking in the Rocky Mountain region. Relax in newly redesigned two-room suites, featuring Green design elements, which bring the Colorado outdoor vibe inside the urban downtown Denver hotel. Enjoy comfortable, home-like amenities such as two 37-inch flat-screen HDTVs, video game consoles, microwave, coffeemaker, mini-refrigerator, all while stretching out in a spacious suite. Start your day with a free made-to-order breakfast. Mingle with other guests and enjoy a variety of snacks and beverages, including some Colorado craft beers, at the complimentary Evening Reception. Explore Denver and enjoy Colorado’s 300+ days of sunshine or take advantage of the 24-hour fitness facility and our indoor saline swimming pool. A block of rooms has been reserved for September 29, 2019 - October 4, 2019. The special room rate of $209 will be available until September 10th or until the group block is sold-out, whichever comes first.